Florida is known as the Sunshine State – the southern tip of Florida is only 62 miles from the Tropic of Cancer giving it a real tropical climate. Florida has a great climate all-year round with an average annual temperature of 72 degrees Fahrenheit and 95% days of sunshine so you will be spoilt for choice when it comes to outdoor activities. The winters are mild and the summer very hot. The temperature chart below shows average temperature (both in Celsius and Fahrenheit) per month for the Tampa Bay area. Of course most people come to Florida to enjoy the beautiful beaches. In this respect we are very fortunate because the Gulf Coast has many of the best beaches in America including the famous Clearwater Beach which has an amazing stretch of white sand. It’s Pier 60 has free entertainment each evening and activities for children. 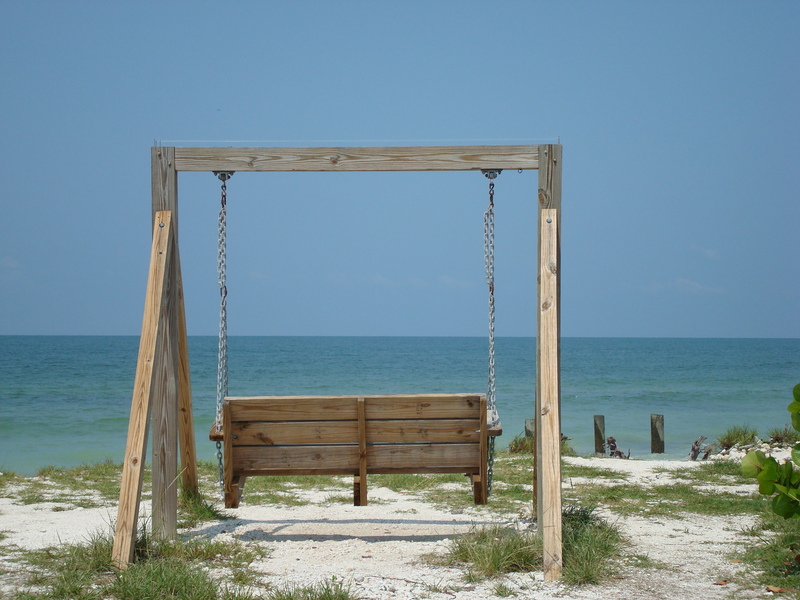 Even closer to us we have the quieter beaches of Honeymoon Island, Sunset Beach, Caledesi Island and Fred Howard Park. Many local beaches have recently received top awards: Fodor’s Travel Publications, America’s largest travel publisher, named Clearwater Beach one of the East Coast’s 7 Best Family Beaches. Expert Dr Beach names Caladesi Island as Best USA Beach 2008 (it was second in 2006 and 2007). TripAdvisor’s list of the top ten beaches in the U.S. has Fort De Soto Park as best beach in the USA for the second consecutive year, while Honeymoon Island State Park ranked ninth. The map to the left shows a series of numbers – these represent beaches – there are lots and lots! This 150-acre county park located west of Florida Avenue in Tarpon Springs features a mile-long causeway connecting the offshore swimming area and the mainland. The park is open 7 a.m. to sunset offering barbecue grills, sheltered pavilions, children’s playgrounds, public restrooms and beach showers. The area is popular for windsurfing and fishing. Link to official site for Fred Howard Park. 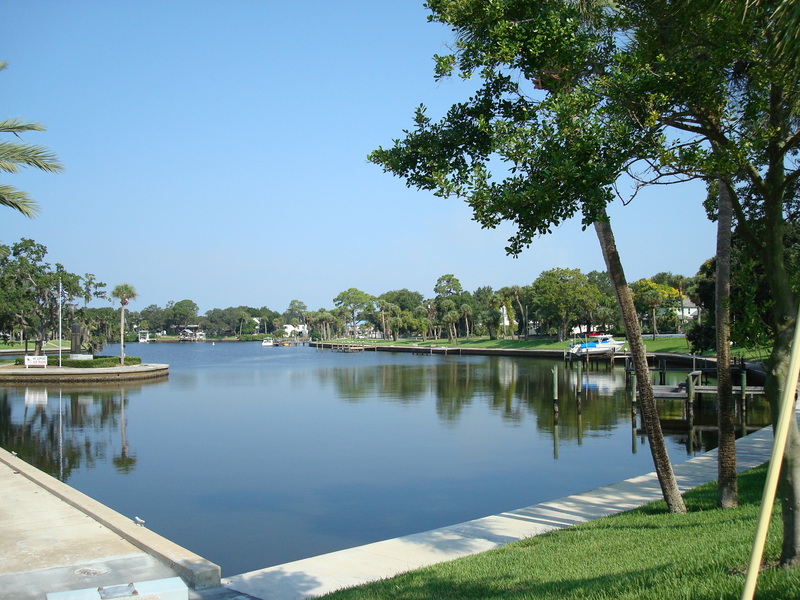 Located at the west end of Gulf Road in Tarpon Springs, is a favorite with locals for picnics, swimming and boat launching. It has barbecue grills, sheltered picnic tables, bicycle stands and public restrooms. Hours are from sunrise to 10 p.m. This state park features sunbathing, shelling, swimming, fishing, picnic pavilions, bathhouses and a park concession building. The Caladesi Island ferry departs from Honeymoon Island. Rated “No 1 beach in North America.” This award came in 2008. In 2006 and 2007 it was rated 2nd best beach in the USA. To get to the 600 acre island you have to get a boat across so the island is free of traffic. The boat leaves from Honeymoon Island state park – also well worth a visit in it’s own right. The park is open daily from 8 a.m. to sunset. This island is the most popular of all the area’s many beaches, especially with families. Clearwater Beach offers just about every water and beach activity imaginable. Pier 60 Park on Clearwater Beach features a family recreation complex on Clearwater’s expansive beach with covered playgrounds, fishing and concessions. The Sunsets at Pier 60 festival features music, entertainment and a beautiful Gulf of Mexico sunset throughout the year. Link to official site for Clearwater Beach. This is very close to our apartments. Although called Crystal Beach this isn’t the place to go with the children as there are plenty of big family-friendly beaches nearby – this is really just a spot to watch the sunset and the birds. There are benches and boats docked. You can hire boats from the boatyard opposite. A recent guest wrote to say “We hired a boat for 2-4 people for half a day and it cost $45 including fuel. Bargain! !” We even have our own mooring outside our 1-bed apartment. This is about a mile up the road and also gives access to Lake Tarpon. Well worth a visit as it is absolutely beautiful. Great covered picnic areas and plenty of restrooms. Just a mile up the road there is the town of Tarpon Springs, a renowned port famous for its Greek community diving for sponges. We must also highlight the nearby town of Dunedin with it’s Scottish links. Dunedin is just north of Clearwater and has access to Honeymoon Island and Caledesi Island. It has a good marina with some tasty waterfront restaurants. You are within easy reach of Disney World, Epcot Centre, Universal Studios, MGM Studios, Sea Life, and all the other attractions in Orlando. The drive is a very easy one as you take highway 4 all the way from Tampa towards Orlando and it takes about 90 minutes. On your doorstep in Tampa, you also have a major theme park, Busch Gardens, famous for having the best rollercoasters in Florida. Tampa itself has all sorts of attractions from waterfront shopping, marinas, Lowry Park Zoo, museums, malls, sports and nightlife. Florida is renowned for good value, delicious food, usually served in large portions! Fine restaurants are plentiful, varying from elegantly simple to simply elegant. Menus include a wide selection from ethnic Italian, gourmet French, Japanese to “down home” barbecue or fresh fish caught daily. There are some fantastic restaurants near to our apartments in Palm Harbor/Clearwater. The choice and variety is simply amazing. Within 5 miles miles we calculate there to be hundreds of restaurants. Cody’s Roadhouse – Outstanding steaks and other dishes. Always good and great value for money. Take a right to go up US19 and it is about a mile on the left. FL39870 US19. Tel: 727 937 1022. Olive Garden – Upmarket Italian food, amazing pastas. Go south on US19 for about 3 miles and it is on the left. 29461 US19. Tel: 727 787 3988. Sweet Tomatoes – Very good salad buffet restaurant but enough other dishes to keep people not into salads happy. Go south on US19 and in approx. 2 miles it is on the left-hand side. 31151 US19. Tel: 727 786 2130. Hiro’s Tokyo Japanese Steakhouse – Opt to go in the room where the chef cooks your food at the table in front of you, it is a great show. Take a right to go up US19 and it is about a mile on the left. 39522 US19. Tel: 727 943 8032. Dennys – American diner. Very good for breakfast. Low-cost. Go north to New Port Richey. Nana’s Restaurant – up to Klosterman Road on 19 north make left and it is a couple of hundred yards on the right. Cute and very traditional, small, plenty of locals. Open for breakfast (very good) and lunch. Eating – we went to Cody’s, which was very good, we also tried Olive Garden as they had a deal – 3 courses 12.95, and this was very good, definately not small portions. The Dockside Bar was also very good, we found it a god send after our journey – lovely swiss, cheese burger and fires, washed down with some Bud Lite. Nana’s was closed as they were on holiday, so most of our breakfasts were at the apartment, we did find a bakery called Panera (think thats what it was called) – it was north on US 19 next junction up from Nana’s = good breakfast sandwich/danish and the coffee was good. If you are looking for fast food -i.e. burgers we would say avoid Wendy’s – ghastly snack in there. Now for all you ice cream lovers…you must go to Cold Stone Creamery (behind Longhorn’s). We first found this ice cream chain whilst on holiday in Marco Island – the ice cream is to die for….the scales tell us so. Found Emily’s Family Restaurant on 19a great for breakfast and Lucky Dill Deli (19 south) very good for snacky food and drinks. Also much liked Tarpon Turtle for its lake side setting and snacks but had a poor dinner there. Outback (s on 19) was our favourite for steaks, fried coconut shrimps and happy hour drinks. For sea food in general we particularly liked Rusty Bellies near sponge dock in Tarpon Springs. For more formal eating with a large menu and a great environment found Ozona Blue very good indeed but need to pre book. 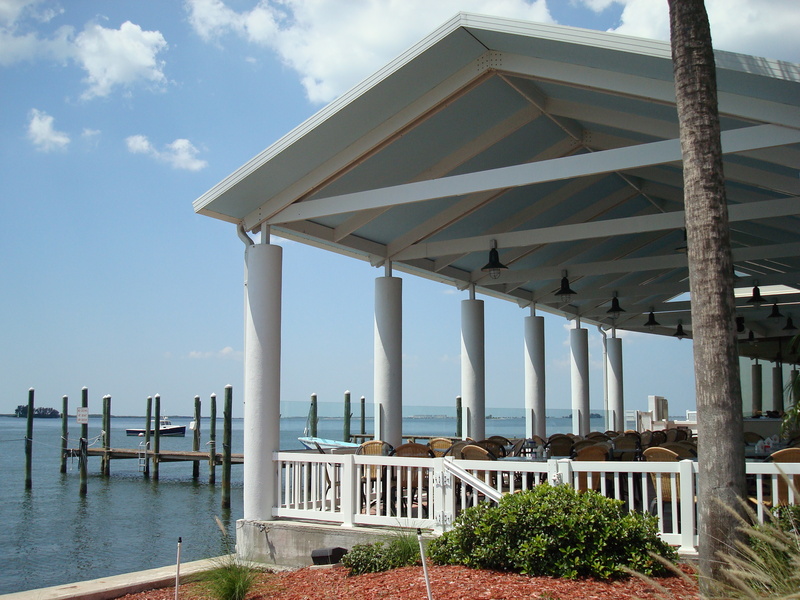 “Info for your web page Shells in Clearwater is closed but we found a good one close to where it had been called Jimmy’s Fish House & Iguana Bar (lovely sea food.) Val, January 2010. “We loved the Greek Pizza Kitchen in Tarpon, we were looking at the menu on the door and a very friendly local woman (having said that all were friendly) said that her daughter comes out from Clearwater to get the takeaways as it was so lovely. Indeed it was, we had a takeaway and ate in (on seperate nights!) and all was excellent and the staff were very nice. Numerous supermarkets (including Wal-Mart, Publix and Albertsons less than a mile away) as well as shops and malls (including Clearwater Mall) are also on your doorstep. 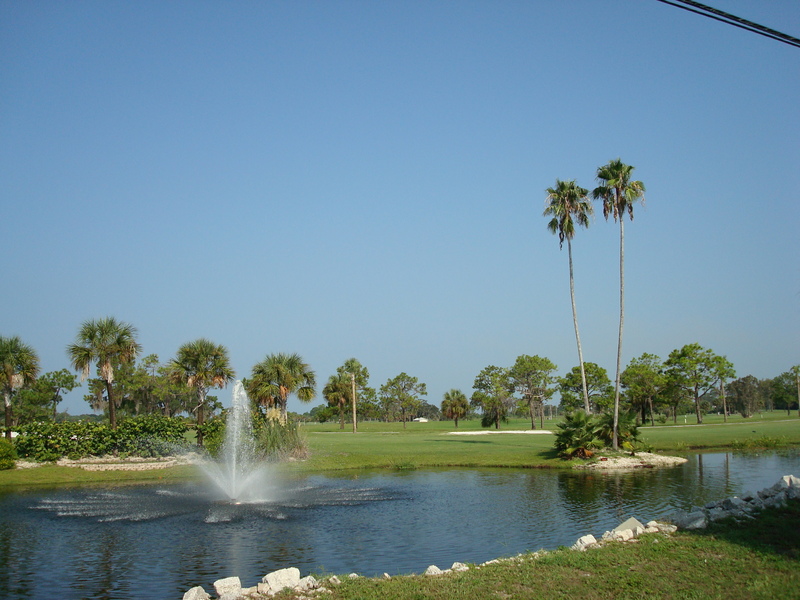 The area is a haven for golf lovers. Less than half a mile away is world-famous Westin Innisbrook Resort which hosts a PGA tour event which attracts golfers such as Tiger Woods. Wentworth Golf club and the Lansbrook Golf course are also top courses but equally there are affordable public golf courses at which players of all standards can just turn up to play. Within 10 miles there are about 40 golf courses!! More information can be found on our useful-links page. There are major sporting teams such as the SuperBowl champions Tampa Bay Buccaneers and the Tampa Bay Devil Rays baseball team. You can also watch spring training for the Toronto Blue Jays and the Philadelphia Phillies. Swimming with Manatees in Crystal River in the Homosassa Springs Wildlife State Park has also been recommended by previous guests. There is a 10-screen multiplex literally across the road. Nearby is the Pinellas Trail which is 47 miles long where you can walk, run, bike, jog, or rollerblade. There are endless other activities for everyone such as great shopping,, water sports, scuba diving, snorkeling, museums (i.e. Salvador Dali in Tampa), art galleries, gambling at the Hardrock casino in Tampa, bowling, zoos, cruises, concerts, nightlife, parks, fishing, sailing, shelling, biking, gyms, tennis, racquetball, basketball, shuffleboard, horseriding, miniature golf, live theater, sightseeing, waterskiing, windsurfing, parasailing, jet skiing, rafting and swimming with Manatees or Dolphins.